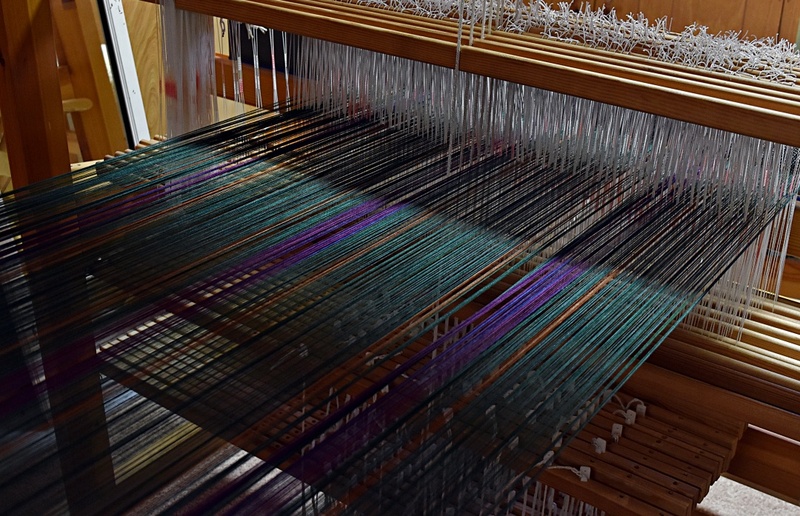 In the past, when I worked in an office and wove on the side, all weaving stopped about the middle of November. After our local guild’s holiday show, I had to turn my attention towards preparing for the holidays. We never knew how many would come to our Thanksgiving table, but I always enjoyed fixing the various dishes my Mom made and adding a few of my own. Gathering, shopping, baking, simmering all kept me out of the studio. Christmas carries many of the accumulated traditions from my childhood with special holiday cookies, breads, and candies. All that in addition to school programs, gift-making, cleaning, and decorating. There just wasn’t time to do much at the loom. Times have changed. Kids have grown. The office job is history. 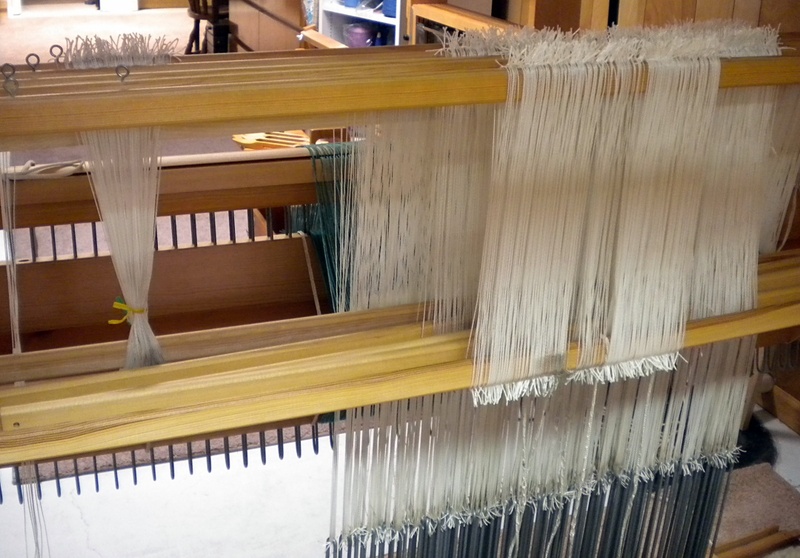 Now my studio is my “office” and I get to weave late into the season! Last week I wound warp for an idea presented to me last month—aprons with pockets. I’ve woven them before, but my latest designs didn’t have the pockets. 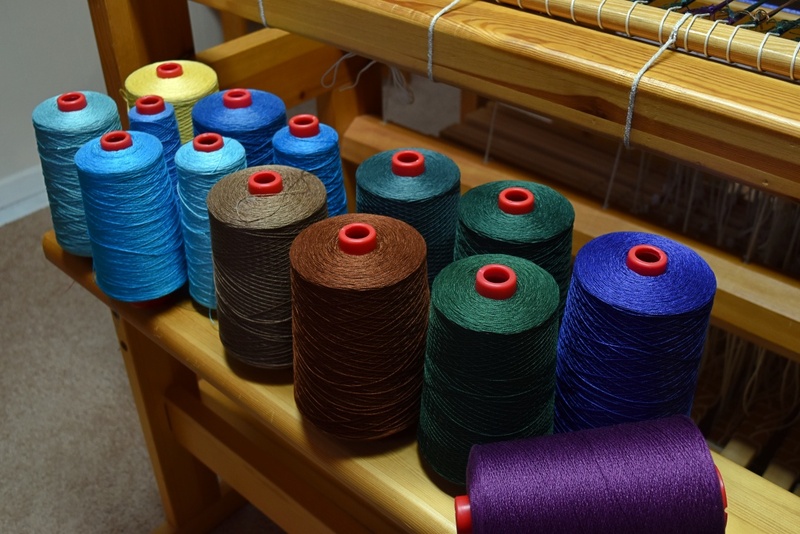 I also noticed while inventorying yarn that I have a lot of gorgeous 10/2 mercerized cotton. Put the two together and the ideas began to sprout. I have enough yarn for two warps, one that looks like grape harvest to me, and another that is more of a Caribbean feel. These colors will warm the January winds! I don’t know if I’ll have time to finish these before Christmas but there’s no deadline. In between batches of cookies and writing cards, I sit at the loom and throw the shuttle. It is such a welcome, peaceful way to ponder the season.